Supernovae, neutron star collisions and active galactic nuclei are among the most energetic phenomena in the known universe. These violent explosions produce high-energy gamma rays and cosmic rays, which can easily travel large distances—making it possible to see objects and events far outside our own galaxy. 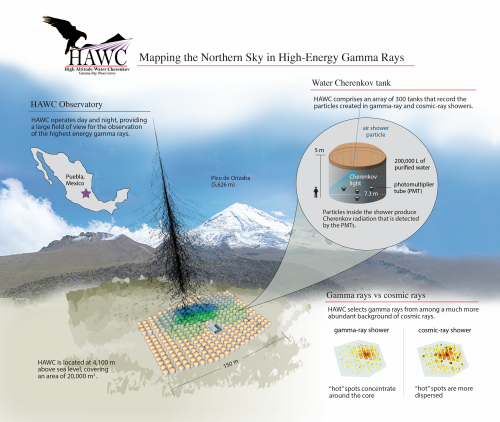 The High Altitude Water Cherenkov (HAWC) Gamma-Ray Observatory, located 13,500 feet above sea level on the slopes of Mexico's Volcán Sierra Negra, is the newest tool available to visualize these explosive events and learn more about the nature of high-energy radiation. Construction is now complete on HAWC's 300th and final detector tank, and the observatory will soon begin collecting data at full capacity. This milestone will be marked with an inaugural event at the observatory on March 19-20, 2015. "HAWC truly is the only observatory of its kind, and will give us a clearer picture than ever before of the high-energy wonders of the universe," said Jordan Goodman, professor of physics at the University of Maryland. 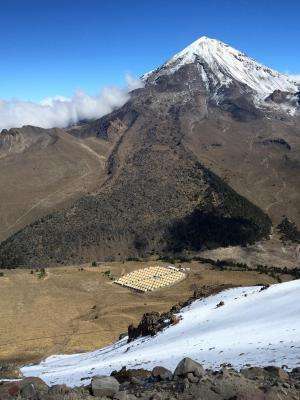 The project is a joint collaboration between the United States and Mexico, and Goodman leads a team of UMD physicists that has managed construction of the observatory since 2011. Goodman will continue in his role as the U.S. lead investigator and spokesperson for the HAWC collaboration. His Mexican counterpart is Alberto Carramiñana, director of the Instituto Nacional de Astrofísica, Óptica y Electrónica (INAOE). Each of HAWC's detectors is a huge tank containing 50,000 gallons of ultrapure water with four light sensors anchored to the floor. When gamma rays or cosmic rays reach Earth's atmosphere they set off a cascade of charged particles, and when these particles reach the water in HAWC's detectors, they produce a cone-shaped flash of light known as Cherenkov radiation. The effect is much like a sonic boom produced by a supersonic jet, because the particles are traveling slightly faster than the speed of light when they enter the detectors. The light sensors record each flash of Cherenkov radiation inside the detector tanks. By comparing nanosecond differences in arrival times at each light sensor, scientists can reconstruct the angle of travel for each particle cascade. The intensity of the light indicates the primary particle's energy, and the pattern of detector hits can distinguish between gamma rays and cosmic rays. With 300 detectors spread over an area equivalent to more than three football fields, HAWC is able to "see" these events in relatively high resolution. To envision how the detectors work, Goodman suggests imagining your computer keyboard as a detector array, with each key representing one tank. Now, approach the keyboard with an open hand at an angle. This represents the cascade of charged particles. The heel of your hand will strike a few keys first, followed by more keys in a defined order as you flatten your palm across the keyboard. "Someone else would be able to determine exactly where your hand came from based solely on the order of key presses," Goodman explained. "HAWC works the same way, with multiple detectors arrayed over a defined space." HAWC has been collecting data since August 2013 when it had only 111 detector tanks. Even then, HAWC was much more capable than its predecessor—an observatory known as Milagro that operated near Los Alamos, N.M. and ceased taking data in 2008. 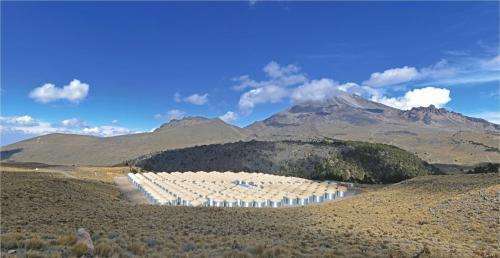 In eight years of operation, Milagro found new sources of high-energy gamma rays, detected diffuse gamma rays from our own Milky Way galaxy and discovered that the cosmic rays hitting earth had an unexpected non-uniformity. The completed HAWC observatory will be 10 times more sensitive than Milagro, and each new HAWC detector has added to the observatory's capabilities and spatial resolution. In the past year and half, HAWC has gathered high-energy images of objects near and far, including the Crab Nebula, star clusters in the Milky Way and the active galactic nucleus Markarian 421. From its perch atop the highest accessible peak in Mexico, HAWC will have 15 percent of the sky within its sights at any given time. As the earth rotates, so too will HAWC's field of vision, meaning that HAWC will see up to two-thirds of the sky every 24 hours. The team's major science goals include studying active galactic nuclei—the bright outputs of energy associated with the growth of supermassive black holes at the center of some galaxies—as well as tracking gamma ray bursts and other large explosions. The researchers will also work to determine the enigmatic nature of cosmic rays themselves. In addition to Goodman, other UMD physics collaborators are associate research scientist Andrew J. Smith, postdoctoral researchers Colas Rivière and Brian Baughman, and graduate student Joshua Wood. The National Science Foundation, the Department of Energy and the Los Alamos National Laboratory provided funding for the United States' participation in the HAWC project. The Consejo Nacional de Ciencia y Tecnología (CONACyT) is the primary funder for Mexican participation. The content of this article does not necessarily reflect the views of these organizations. "... when these particles reach the water in HAWC's detectors, they produce a cone-shaped flash of light known as Cherenkov radiation. The effect is much like a sonic boom produced by a supersonic jet, because the particles are traveling slightly faster than the speed of light when they enter the detectors." That's the speed of light in water.